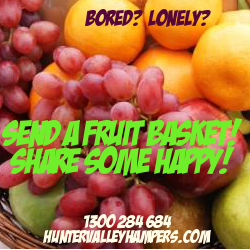 Gourmet Christmas Hampers and Xmas Gift Baskets for delivery. A Wine Basket is much more than simply a presentation of one or two bottles of wine as a gift basket. 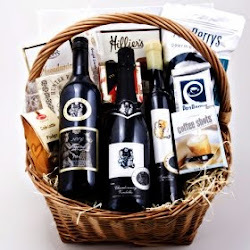 At a basic level, a wine basket can be merely the wine in a box, but there are many more creative and visually appealing options to impress your recipient with, from ready to open champagne celebration gift baskets, to gourmet wine appreciation hampers, to the cheese and wine sampler pack. A wine basket can be a complete gift experience with complimentary items to heighten the whole moment of receiving a wine basket - elevating the moment of sharing to a truly memorable and meaningful occasion. An evergreen wine basket concept is that of the Champagne Celebration. The Champagne Celebration is a gourmet gift experience comprising champagne (of course! ), two champagne flutes stuffed with twist wrap chocolates, a box of gourmet crackers, and all presented in a silver service ice bucket. The gifting concept is to give a champagne experience that is available for instant use, like having an ice bucket with champagne delivered by room service. This solves the dilemma of what to put in a wine basket by moving away from the idea of a basket completely and making the receptacle a feature of the gift idea as an ice bucket. Wine baskets can be at their most affordable as a simple wooden display box with a single bottle of wine presented on wood shavings with a cellophane wrap and bow. This is certainly cost effective and meets client demands in terms of price point and being a wine gift idea, but it does not say much for creativity or meeting individual client preferences. However, in the case of a particularly superior bottle of wine, it is this subtle understated simplicity that can convey a certain classic style. For more thorough wine experience, we have had quite remarkable success sharing a wine appreciation gourmet hamper, which presents the recipient with much more than just a couple of bottles of wine. For starters, the wines are from the same vineyard, so the impression is of receiving a taste of the vine from this estate only, with two premium wine varietals being offered. In most cases we would offer a Semillon and a Shiraz, although depending on the demands of the client it would not be unusual for a sparkling wine to be paired with a botrytis dessert wine. Key to the wine basket is flexibility and being able to meet the specific client demands as they arise. The wine appreciation hamper is popular because it combines a generous two or three bottle sampling from the estate with a range of easy to share accompaniments that are well suited to the wine experience. Like cheeses, handmade crackers and crisp breads, and pates and pastes. Bringing this all together again elevates the simple idea of products in a box to a more experiential level, where the wine basket is indeed a gourmet hamper. Bren Murphy Author. Simple theme. Theme images by konradlew. Powered by Blogger.